Little Sand Point. Photo by Eric Adsit. 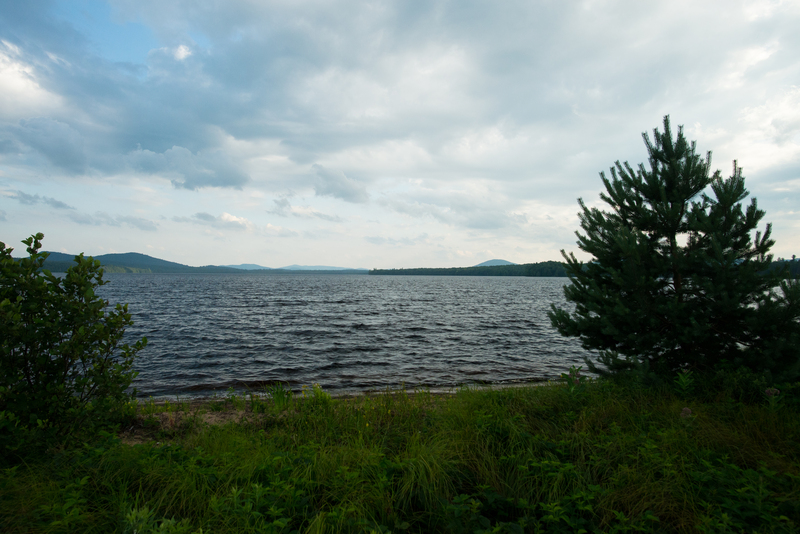 This charming campground rests on the northern shore of Piseco Lake. It has a certain rustic character to it, yet the updated facilities and relatively quiet area is a sure bet when it comes to enjoying the southern Adirondacks. There are 74 sites, many of which are by the water with their own private mini beaches. The campground features potable water, several restrooms, and a newly renovated shower facility. 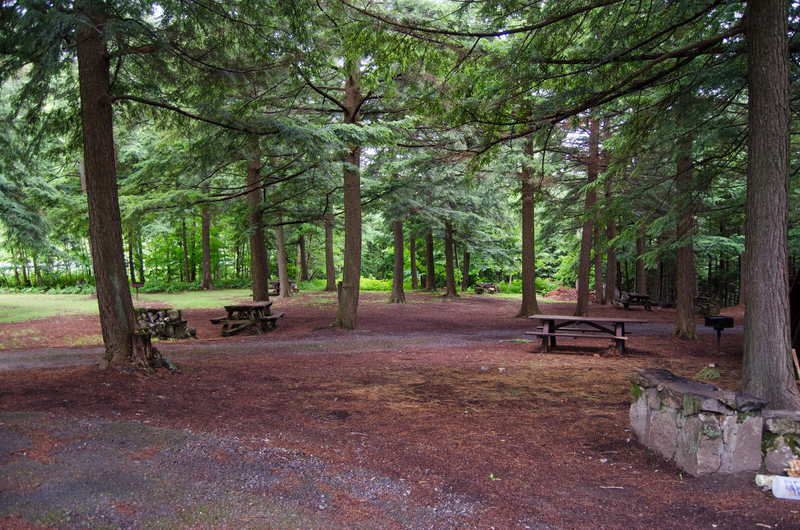 Picnic tables and stone fireplaces are included with all campsites. A boat launch allows for canoes, kayaks, and larger motor boats, and there is a long, quiet road along the north shore of the lake that lends itself to cycling. It is open from mid-May to early September, and dogs are allowed. Nearby, there is a 1.4-mile hike to the Echo Cliffs with an excellent viewpoint over the lake. The swimming hole at Rogers Rock Campground. Photo by John Haywood. This pleasant campsite is only 6 miles south of Fort Ticonderoga, a French fort pre-dating the American Revolution, and the campsite’s name is attributed to Robert Rogers, an English Colonial who fought during French and Indian War. 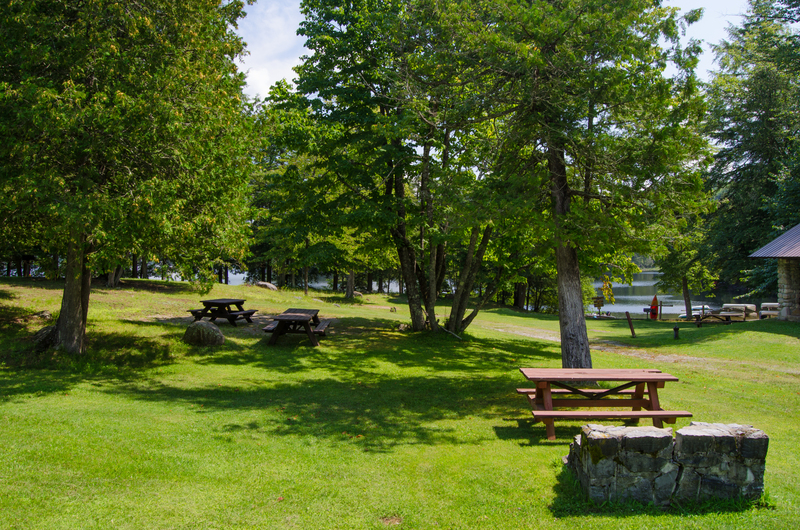 There are 322 campsites and two group camping sites here with many amenities including a picnic areas, fireplaces, pavilion rentals, flush toilets, hot showers, dump stations, a boat launch, mooring buoys, a recycling center, a boat pump-out station, bathhouse, and guarded swimming area. A large sandy beach and boat launch make it easy for guests to enjoy the scenery either lakeside or on the water. Pharaoh Lake Wilderness is located just 3.5 miles to the west with a plethora of opportunities to extend the adventure. Paradox Lake's day use area. Photo by John Haywood. This campground has 58 sites and is a pleasant place to fish, paddle and hike. On shore, there is a picnic area with many tables, grills and a covered pavilion. It is located in the Dark Bay of Paradox Lake, where there is a boat launch with available rentals. Canoers up for a short portage will be delighted by the trail network to Crane, Oxshoe, Crab, Putnam and Horseshoe Ponds. This campsite is also near the Pharaoh Lake Wilderness, where there are over 70 miles of trails, 38 primitive tent sites and 14 lean-tos available in the wilderness. 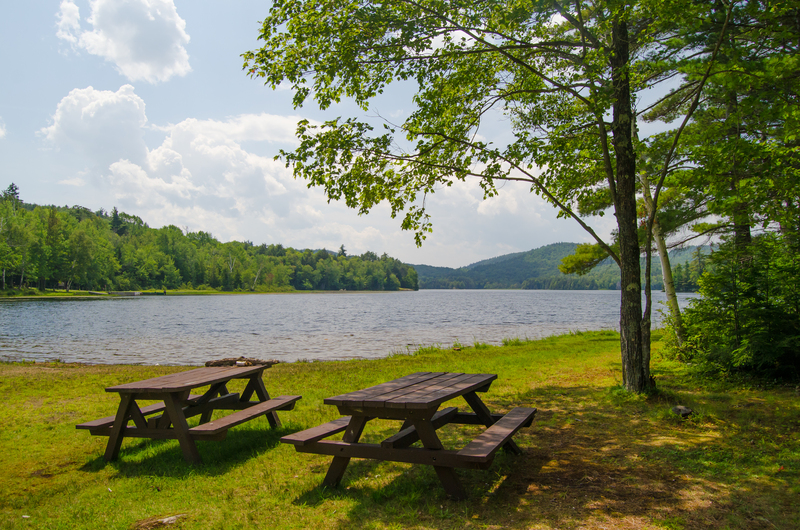 Picnic tables on the shore of Putnam Pond. Photo by John Haywood. Locally known as "Putts Pond," this campground was named after the famous General Putnam who was a Revolutionary War officer. There are 72 campsites, of which nine are remote and found on islands across the pond. On shore there are ADA-accessible sites, hot showers, flush toilets, trailer dumping station, recycling center, boat launch site, picnic area, firewood sales, and canoe/kayak/rowboat rentals. (Swimming is not permitted.) 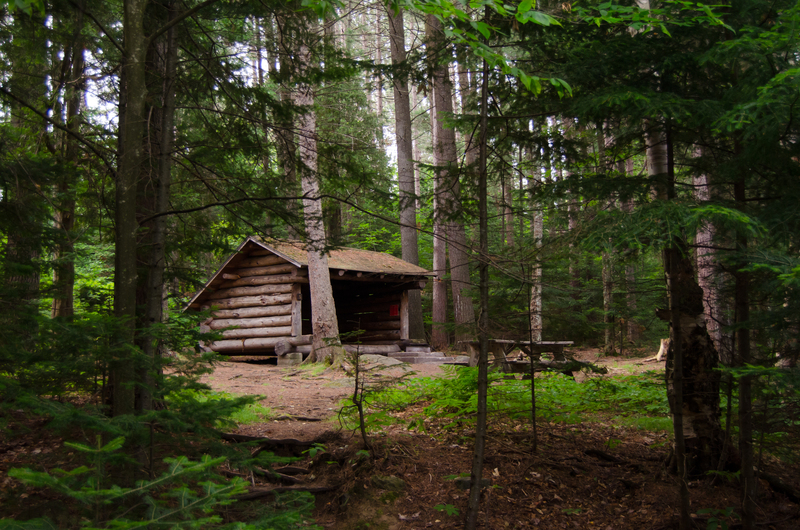 You’ll be delighted by these spacious campsites that are surrounded by the classic conifers of the Adirondack region. This is a third campground near the 46,000-acre Pharaoh Lake Wilderness Area. A sheltered campsite at Heart Lake. Photo by John Haywood. 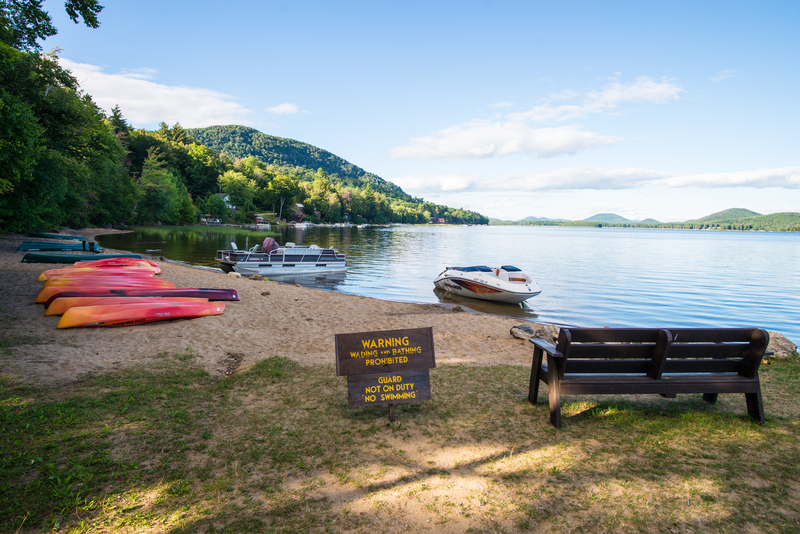 This campground is perhaps one of the most popular destinations in the Adirondacks. It is family friendly and very accommodating. Thousands of people visit here each year to experience this serene location nestled in the High Peaks Wilderness. The Adirondack Mountain Club operates three cabins in addition to the Adirondack Loj, which can accommodate up to 38 guests in a variety of rooms. 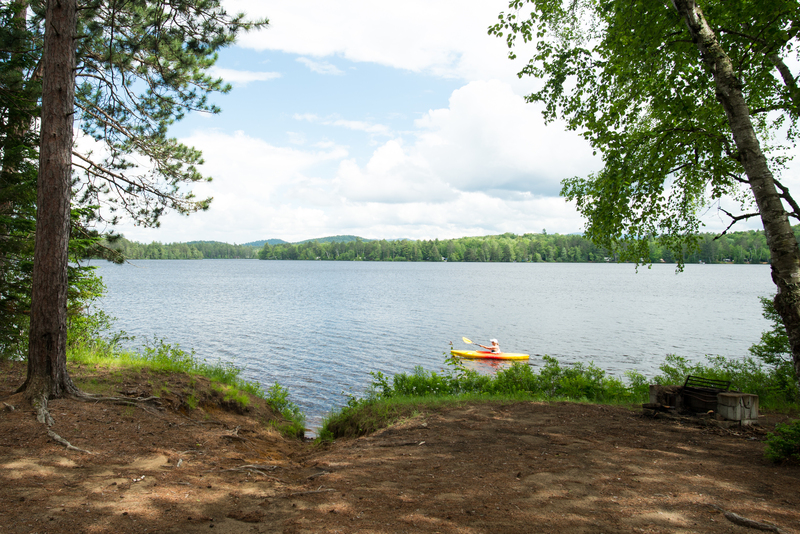 There are a variety of campsites, and Heart Lake is open for swimming, fishing and paddling, and a number of classes and programs available to campers. If you’re looking to separate from the Loj, there is also a wilderness campground with 32 sites, 16 lean-tos and six canvas cabins available year round. This is the starting point for the Van Hovenberg Trail that leads to the Marcy Dam, Indian Falls, and the summit of Mount Marcy, the highest peak in New York State. Some of the other hiking destinations include the MacIntyre Range, the Mount Colden Trap Dike, Avalanche Lake, Marcy Dam, the Flowed Lands, Mount Jo and Rocky Falls. The picnic area in Wilmington Notch. Photo by John Haywood. Within hiking distance of the the splendid 40-foot Wilmington Notch Falls and amid a region carved out by millennia of glacial forces lies this campground run by New York State offering 54 tent and trailer sites. On site there are bathrooms, one shower building, and picnic tables for campers at a day use picnic area. Hiking and fishing are available at nearby locations on the river. A trail leads down the steep embankment to a spot to view the splendid falls. Less than a half mile away, guest can visit Whiteface Mountain, where hiking trails lead along the river and along Stag Brook. Gondola rides up Little Whiteface are available nearby, or you can drive up to the summit of Whiteface by way of the Veterans’ Memorial Highway. The Wilmington Flume Trail System, with 13 different trails and swimming and fishing holes, is also a short distance away. Be sure to check out the Olympic village of Lake Placid with shopping, restaurants, movies, tours and much more. 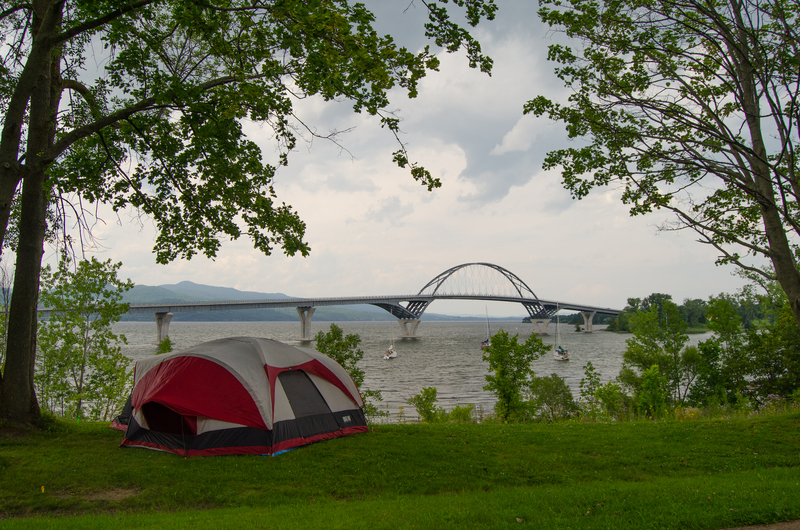 A campsite with a view of Crown Point Bridge. Photo by John Haywood. You will immediately notice the Champlain Bridge that links New York and Vermont, but try to think back to a time in the 1700s when this landscape was once dominated by forts, settlements and battlegrounds as part of the struggle for control of the waters of Lake Champlain. Situated on the western shore of this water body, Crown Point Campground has 66 sites, hot showers, a trailer dump station, a recycling center, a small picnic area, firewood sales, handicapped-accessibility, and a boat launch. The picnic area is placed in a grove of tall pine trees and handicapped-accessible spots that include paved areas around the tables and grills. Guests can explore the Champlain Memorial Lighthouse, which was dedicated in 1912 to commemorate the 300th anniversary of Champlain’s discovery of the lake. The Crown Point Historic Site, located down the road, is also an excellent place to explore some of the local history. A view of Rollins Pond. Photo by Eric Adsit. This secluded and quiet campground is accessible through Fish Creek Pond State Park. Rollins Pond is 442-acres and very popular among paddlers and fisherman. Its many bays and inlets are great places to watch birds and explore a classic Adirondack lakeshore. Fisherman will find bass, northern pike, and yellow perch, as well as a few other species. The A-loop sites are located at the south end of the pond nearest the entrance to the campground, but many of the best sites are found in the 180 to 220 range. Be sure to drive the length of the campground to pick your favorite site. There are two boat launches between sites A11 and 1. The larger boat launch allows for trailers and boats with motors of 25 horsepower or less and provides access to Rollins Pond. The second is found on the east side behind the assistant caretaker cabin. It is a car-top boat launch for paddlers to access Whey Pond. A paddler passes a campsite at Fish Creek. Photo by Eric Adsit. This campground has over 300 sites, most of which are waterfront, and it is just a short drive from the Adirondack High Peaks. Its proximity to these incredible adventure grounds makes it one of the region’s favorite camping locations. 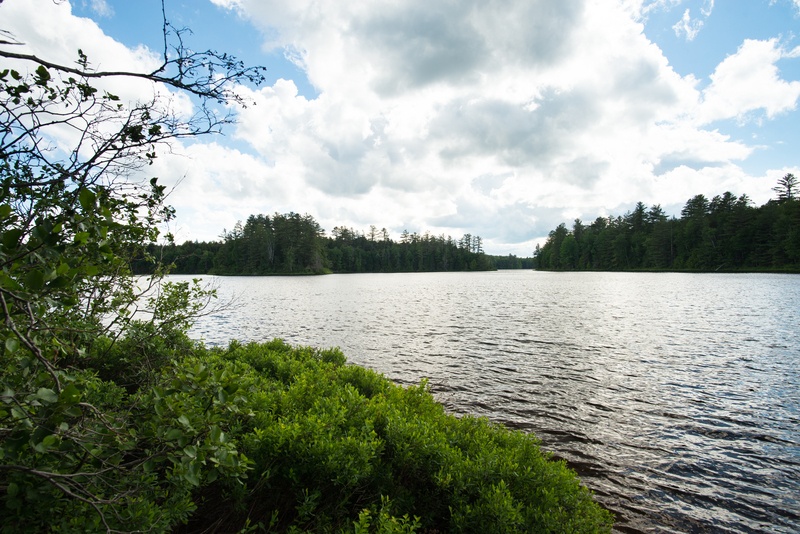 The campsites line the shores of Fish Creek Pond and Square Pond, which provide access to Follensby Pond and Upper Saranac Lake via a short portage and a channel, respectively. The sites are mostly level and slightly wooded with a mixture of sand, gravel and dirt surfaces. While none of the sites are specifically designed for RVs and no hookups are available, many sites are expansive enough to host large RVs and trailers. Despite the vast number of sites, it is recommended to make reservations at least a few days in advance, especially on weekends. 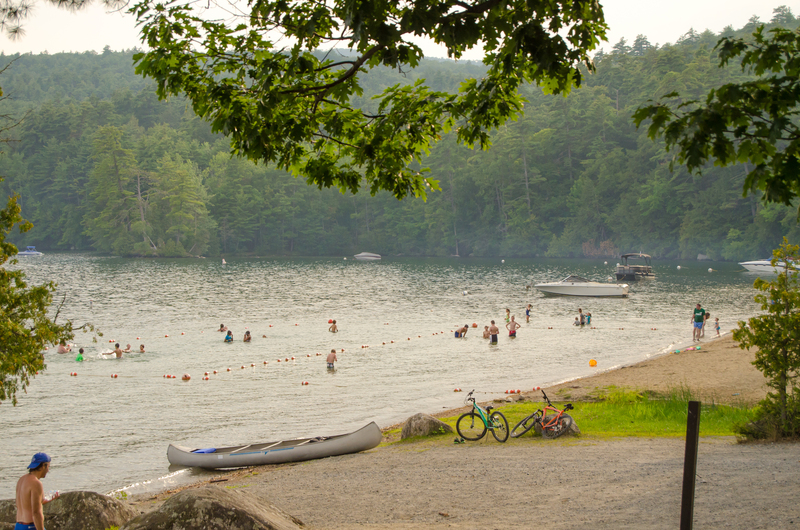 The campground also features opportunities for fishing, paddling, hiking, biking, swimming, basketball and volleyball. Meacham Lake. Photo by Eric Adsit. This campground in Meacham Lake State Park offers water access and hiking without the crowds. It features 224 campsites, a swimming beach, boating access, and much more. This was once the site of the Meacham Lake Hotel that operated in the early part of 20th century until it burned down. The campground was later constructed by the Civilian Conservation Corps, and it remains a popular destination today. Hot showers and flush toilets are available as well as rowboat and canoe rentals, a boat launch with a floating dock, a hiking trail that starts right in the campground, a swimming beach, and a playground. Many of the amenities are spread throughout the campground and can be challenging to find, but the campground staff is always helpful and willing to point you in the right direction. Most of the sites are spacious and on level, grassy ground.